Limitations, terms and conditions are described in the application form, see button below. We have over 5,800 active subscribers and over 4,000 Facebook followers. Have information to share? We are accepting short articles on a topic of your choice that falls under safety and/or health. It's a great way to introduce your business or nonprofit to a local community, share event announcements, etc. Contact Andrei, ahfair@ak.net. – Host hands-on demonstrations to attract attention and make your exhibit stand out from the crowd. Let Health Fair attendees try new and exciting things – this will make their experience more memorable and will attract others to your booth. – Give away promotional items related to the topic of your education. For example, for dental care, you can give away free floss with your contact information on it. Every time someone uses your giveaway item at home, they’ll remember your organization. – Promote your booth through Alaska Health Fair Newsletter (5,000 subscribers) and Alaska Health Fair Facebook (>2.6K Likes). Research shows a vast majority of attendees come to an event with a goal of visiting a specific booth, so be sure to do this promotion before your Health Fair. We encourage our exhibitors to submit a half-page educational article on a topic of your choice to be included in AHF Newsletter and AHF Facebook Page. Interested? Send your request to ahfair@ak.net today! There’s no cost involved. – Offer free prize drawings: an Apple watch, a book, movie tickets, etc. It really helps to generate attention if the item is currently desirable/fashionable. Be careful not to collect people’s personal information without explicit consent. – Utilize storytelling in your exhibit, printed materials, and giveaway to make your point and to make your education more memorable (please take care not to violate our rules on graphic and political content). – Just like you could utilize our social media channels, advertise your booth on your own Facebook and Twitter accounts before your Health Fair. Post announcements, encourage your Facebook and Twitter followers to seek you out and to bring their friends to your booth. Give them a positive reason to come over: invite them for a demonstration, a prize drawing, or for a one-on-one talk or consultation. AHF events offer a friendly, pressure-free environment for your audience to connect with you. Pick one or two things from the list above to try this year and watch your results grow! 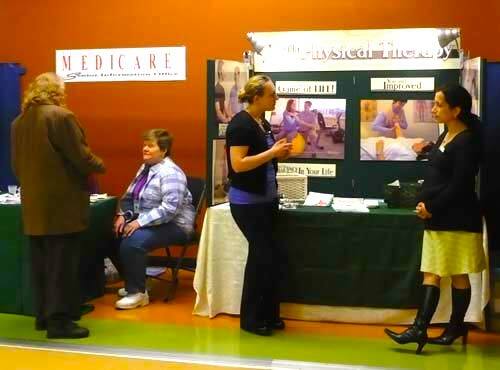 We view our Health Fairs as a way for Alaskans to get in touch with their local healthcare and wellness providers, receive useful information on topics they care about, and access affordable preventative screenings and tests. Education is the main goal of our events. You are welcome to distribute promotional information about your practice, business, non-profit service or a government program; host a free class or demonstration; distribute free product samples—as long as it helps Alaskans maintain a healthy lifestyle. Collecting information from participants is allowed, but only with explicit consent. If you work in health care or wellness, our events can help you grow your practice, connect with the local community, and raise awareness about your cause. Our Health Fairs are designed to benefit the entire community: people, businesses, non-profits, and agencies – all working together to ensure great health for all Alaskans. Exhibitor space is free; however, we depend on charitable contributions and donations. If you appreciate opportunities presented by Health Fairs, please support our work by making a (tax-deductible) donation. Thank you!